Native spreaking teachers, customized curriculum, special costume designed material, webiste support, materials, CD, workbooks and flashcards! Our full immersion classes will prepare the children of today's world to become the Global Citizens of the future! They will not only become bilingual but will also get to know other cultures, traditions and holidays from Spanish speaking countries. O ur curriculum is a highly structured method, breaking the 45minute/1 hour lessons into components of five to ten minutes or less. But this framework allows a great deal of flexibility, as teachers can select from a multitude of Adventure Learning™ Challenges and other activities to fit the needs of their students. The materials are all designed to improve a child's vocabulary, promote sound-word association, specific cognitive-language skills, sight-word, letter-sound recognition, basic Spanish phrases, phonetics and pronunciation. Spanish will be taught in a practical and fun manner. Toddler's class; Children will follow instructions in Spanish and even sing songs with their friends in class and at home. Materials and songs are designed to improve a child's vocabulary, promotes sound-word recognition, basic phrases and greetings. 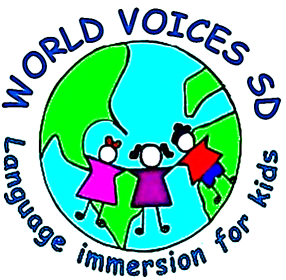 K-1 grade; Introduction of vocabulary through songs, games, flashcards, sound-word association, total physical response (TPR), specific cognitive- language skills, sound of the vowels, and new survival phrases every week. Parental support is needed to practice at home (learn with your child). Expect a silent period at this age we just want the child to be exposed to the language, recongize the stucture, follow instructions, and enjoy singing and playing in Spanish. 2-4 grade; Sounds, vocabulary, feminine and masculine articles, as well as singular and plural, while practicing every day new words and phrases, writing and construction of simple sentences depending on the child's level. 5-6 graders; At this age we focus more on sentence construction, vocabulary and grammar that goes far beyond most elementary and middle school curriculum, verbs conjugation and reading comprehension. 7-8 graders; With this group we cover important Spanish rules and exceptions, more vocabulary and grammar with a special focus on Spanish 1-2 curricula to be ready for High School. (verbs, adjectives, articles, reflexive verbs, regular and irregular verbs). Spanish for Spanish Speakers; We cover Mexican grammar and spelling curricula based on the secretaria de educacion publica curricula. Morning coffee: conversational Spanish for parents after dropping off their children at school, form a group and our teacher will work with you. High school and middle school tutoring; Individual or group lessons, call to set up a class that best covers your child needs. Added to every lesson are extension activities to provide reinforcement opportunities for students who attend more than once a week, or just more options for fast learners. Our teachers are thus able to teach a variety of students within a class, and adjust classes to fit the needs and administrative elements of various types of classes.